← Scafell Sky Race 2019- The SSR has grown up! 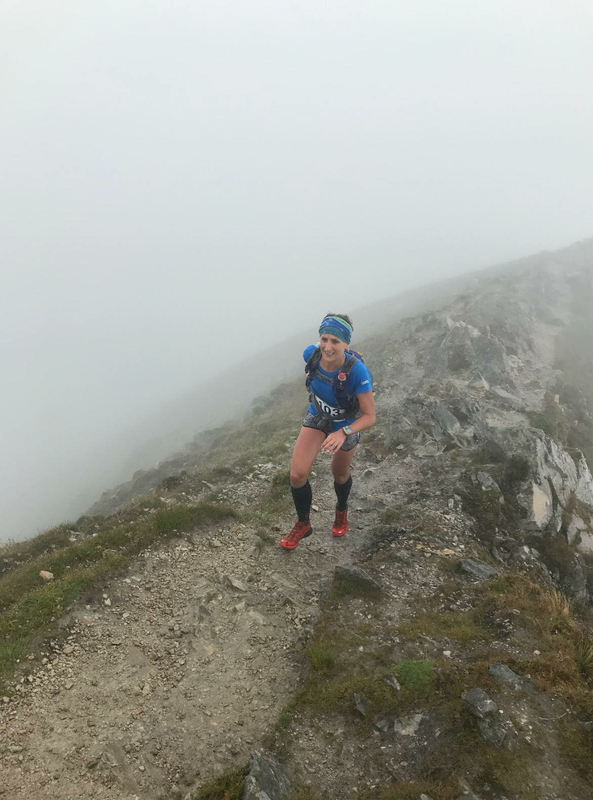 Excel Sports are hosts to Ireland’s first skyrunning event, and are delighted to be part of the Skyrunner UK & Ireland 2019 National series. The event is being held in Donegal, the most Northerly county on the island of Ireland…. But still only 3 hours from Dublin, and 2 hours from Belfast. Donegal is a mystical, magical place, which boasts wild rugged unspoilt landscapes, and an incredible coastline with some of the most spectacular views in Europe. Donegal was voted ‘Coolest place on the planet’ by National Geographic in 2017, and for good reason…. Journeying Northwest along sleepy roads that cut and curve through the Gaeltacht, an area where the Donegal Irish dialect still flourishes, brings you to the village of Dunlewey, host of the Seven Sisters Skyline 2019. Dunlewey is a small Gaeltacht village in the Gweedore area of Donegal, situated at the foot of Mount Errigal, which is the highest mountain in Donegal. Also known as the Derryveagh Mountains, the 7 sisters frame a valley that wouldn’t be out of place in JRR Tolkien’s “The Lord of the Rings”!! The Derryveagh mountains are the major mountain range in Donegal. Commonly known as the “Seven Sisters”, each of the seven mountains have their own gaelic names of Errigal (751 m), Mackoght a.k.a. Little Errigal (555 m), Aghla More (584 m), Ardloughnabrackbaddy (603 m), Aghla Beg (564 m), Crocknalaragagh (471 m) and Muckish (666 m). What these mountains may lack in Altitude, I guarantee you they more than make up with their Attitude !! 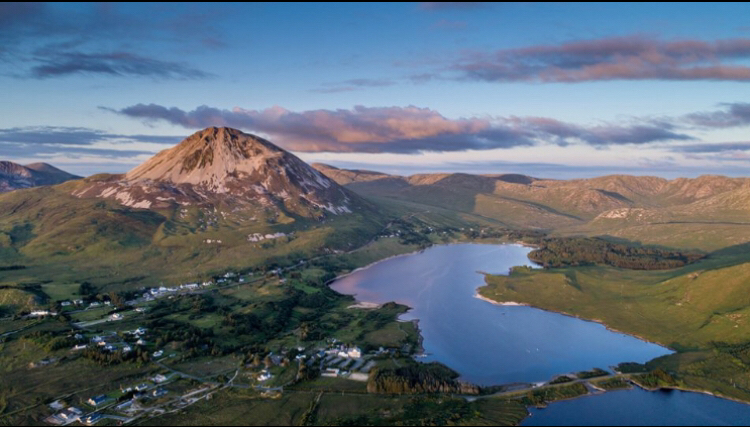 2019 will see competitors gather in picturesque Dunlewey, Co. Donegal, where they will take in magnificent views of the Atlantic Ocean, and surrounding Counties for the Seven Sisters Skyline 50k. Race director Eunan Quinn created the Seven Sisters Mountain Marathon in 2018, an event which he felt needed to be added to the Endurance Calendar in Ireland, and the event didn’t dissapoint !! Regarded as one of the toughest runs in Ireland by competitors, with a winning time of 6 hrs for male winner, 7 hrs 41 for female winner it tested the strength, endurance and characters of all who participated. “TOUGH, TOUGH course (and I only did the half) in a stunningly beautiful part of the world. This event is not for the faint hearted and not to be entered lightly. Superbly organised with a tricky course immaculately signposted. Eunan and his team have thought of everything in the planning and execution of the event, and really allow you to relax and focus on surviving the sufferfest!!! “Highly recommended but not for casual runners. Rough, tough route but really enjoyed it as i’m a bit mad anyway!! Preparation from the organisers was first class as were the check points. Will definitely be back !!! Gillian Wasson – 2018 Seven Sisters Female Champion. Seven Sisters Skyline Route / Course details. 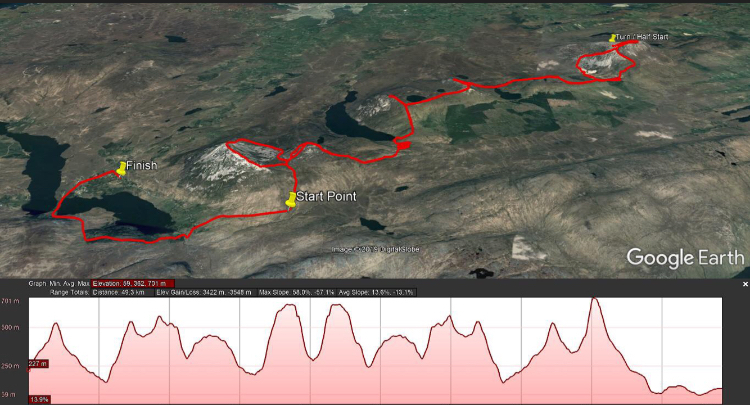 The 50k Skyline is an out and back course doing all peaks twice, except for the mighty Errigal. The course is unique in that there is little or no defined path for most of the course – just wild open mountain, soft boggy heathery ground, and rock and scree on the technical sections. The route begins at the foot of Errigal. A short run on heathery ground to the first small technical section to Mackoght, which will give competitors a taste of what’s to come later on the course on this rocky scrambling section. A descent off Mackoght and onto a track for a fast section to drop down to Altan castle, and a short run across the beach at Lough Altan. The first big test awaits competitors as they will ascend 450m in 2k to Aghla More, a grass / heather steep wall to the summit, then across to Aghla Beag on soft bog, and once on top of Aghla Beag a steep descent into the valley. A running section until competitors drop down to a 1k road section at the base of Muckish, across ‘the bridge of tears’ into Muckish quarry and the first big technical test on the course. A tough scramble to top of Muckish, and hairy descent on the miner’s path to turnaround checkpoint. Competitors will ascend the miners path, descend Muckish on the traditional route, cross the road and back into the wilds toward the Aghlas. Here competitors will be totally isolated, with no one except fellow runners for the next 12km. On approaching the Aghla’s competitors will face locally known as ‘heart attack hill’ a grass wall, and this is where the top competitors will know they are in a race. Across the Aghla’s, a steep descent off Aghla More and onto Mackoght. A steep technical descent off Mackoght, around to the North side of Errigal for a massive technical climb to summit Donegal’s highest mountain and last peak. Down the south side of Errigal, crossing the road toward Dunlewey estate, and a final push around the lake toward the finish line. It’s truly an EPIC course that will test all competitors to their limits both physically and mentally. Since announcing the Seven Sisters as a Skyline event for 2019, interest has peaked both nationally and internationally, with competitors from various countries already having signed up. This is an event not to be missed !! Join us on July 28 to earn the accolade of saying you competed in Ireland’s first Skyline event in“the coolest place on the planet”. This entry was posted in Uncategorized and tagged less cloud more sky, republic of Ireland, Running, sky uk, Skyrunning, technical. donegal, trail, UK & Ireland, ultra, vertical. Bookmark the permalink.